[Nubmian] wrote in to share his experiments with measuring airflow in an HVAC system. His first video deals with using with ultrasonic sensors. He found an interesting white paper that described measuring airflow with a single-path acoustic transit time flow meter. The question was, could he get the same effects with off-the-shelf components? [Nubmian] created a rig using a pair of typical ultrasonic distance sensors. He detached the two transducers from the front of the PCB. The transducers were then extended on wires, with the “send” capsules together pointing at the “receive” capsules. [Nubmian] set the transducers up in a PVC pipe and blew air into it with a fan. In his second video, [Nubmian] sets up a test rig consisting of a multimeter connected to an airflow sensor. The multimeter is soon replaced by an Arduino with the help of an AD623ARZ amp. The wires for that setup needed some shielding. Aluminum foil connected to the ground did the trick. For more HVAC projects check out this pinwheel flow meter and [Adam]’s piece on HVAC techs, hackers who make house calls. Prextron CHAIN BLOCKS - Arduino Nano controlled Ultrasonic sensor that switches a motor wirelessly using 433MHz RF modules and a relay board. In this tutorial, I will be evaluating Prextron CHAIN blocks – a new system that allows you to connect your sensors and actuators to an Arduino NANO using clever 3D-printed prototyping boards that can be stacked sideways. 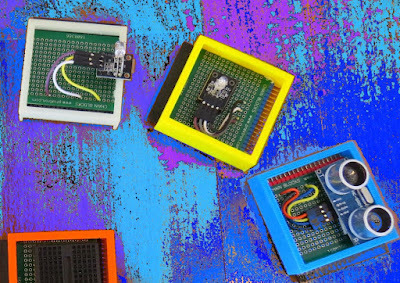 This very modular system makes it easy to connect, disconnect and replace project components, and eliminate the “rats nest of wires” common to many advanced Arduino projects. CHAIN BLOCKS are open, which means that you can incorporate any of your sensors or actuators to these prototyping boards, and you can decide which specific pin on Arduino you plan to use. The CHAIN BLOCK connections prevent or reduce common connection mistakes, which make them ideal for class-room projects and learning activities. 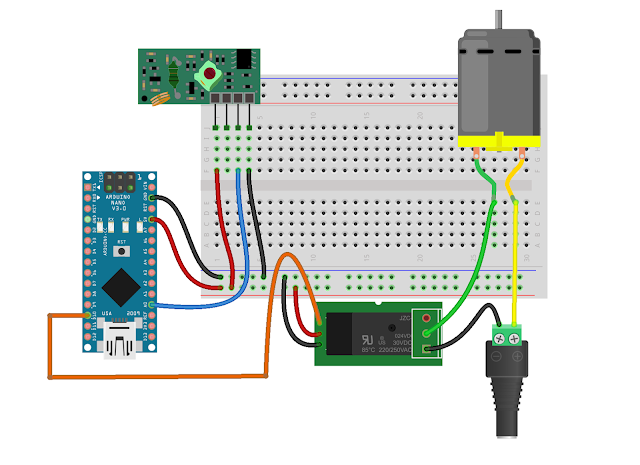 When I place my hand in-front of an Ultrasonic sensor, the Arduino will transmit a signal wirelessly to another Arduino, and consequently turn on a motor. Please note: You may need to solder the module wires to the CHAIN BLOCK protoboard. The design is simple, the product is simple. Once the Chain Blocks were all assembled, they were very easy to connect to each other. I can really see the benefit of Chain Blocks in a teaching environment, because it simplifies the connection process, and reduces connection mixups. It was good to see that the blocks come in different colours, which means that you can set up different colour schemes for different types of modules. You can incorporate pretty much any sensor or Actuator into the Chain block which is very appealing. You also have the flexibility of choosing which pins you plan to use on the Arduino. Projects look a lot neater, because you no longer have the rats nest of wires. The Blocks lock into each other which means that they are much easier to transport/carry. The need to solder modules to the protoboard, may be a discouragement for some people. I would have liked a choice of different size Chain blocks. Some of the sensors did not fit nicely into the Square blocks. Prextron really need to work on their website if they plan to get serious with this product: Webpage has incomplete functionality or irrelevant links etc etc. Visit my ArduinoBasics Google + page. Follow me on Twitter by looking for ScottC @ArduinoBasics. I can also be found on Pinterest and Instagram. Have a look at my videos on my YouTube channel. Digital White/Black Boards or “Smart Boards” are very useful in modern classrooms, but their high cost often makes it difficult to convince administrators from loosening their purse strings. Cooper Union’s 2nd annual HackCooper event in New York wanted students to design and build hardware and software projects that both solve real problems and spark the imagination. At the 24 hour hackathon, the team of [harrison], [david] and [caleb] decided to put together a low-cost and simple solution to digitizing classroom black board content. A chalk-holder is attached to two strings, each connected over a pulley to a weight. The weights slide inside PVC pipes at the two sides of the black board. Ultrasonic sensors at the bottom of each tube measure the distance to the weights. The weights sit in static equilibrium, so they serve the purpose of keeping the string taut without negatively interfering with the writer. With a couple of calibration points to measure the extent of displacement of each weight, board width can be determined, making it easy to adapt to different sizes of boards. Once calibrated, the system can determine position of the chalk over the board based on some trigonometrical calculations. Since they had just 24 hours to hack the system together, they had to use a hand operated radio with a couple of buttons to provide user control. Pressing the “Write” button starts transmitting chalk movements to the digital screen. A second button on the radio remote serves to “Erase” the digital screen. After receiving the chalk position data, they had to do a fair amount of processing to eliminate noise and smooth out the writing on the digital screen. A server allows the whole class to receive the chalk board data in real time. After each “Erase” command, the chalk board state is saved and logged on the server, thus allowing previous content to be viewed or downloaded. If only text is written, optical character recognition can be used to further digitize the content. What makes the project really useful is the low cost. The sensors cost a dollar. The other parts – PVC pipe, weights/pulleys, Arduino and the Radio key fob – were all bought for under 40 dollars. For some additional cost (and maybe more time in their case) they could have automated the detection of when the chalk was actually doing the writing. The team have made their code available on Github. For a Chalk board at the other end of the cost spectrum, check this one out. Video below. Fans of the bouncing lamp from the Pixar corporate logo will enjoy [Daniel]‘s latest project. It’s a motion controlled desk lamp that uses ultrasonic sensors to control its physical position. The core of the project is an Arduino and the three ultrasonic sensors. The sensors act as range finders, and when they are all working together under the direction of the microcontroller they can tell which direction a hand was moving when it passed by. This information is used to drive two servos, one in the base and one on the lamp’s arm. The project requires an articulating desk lamp of some sort (others besides the specific one [Daniel] used shouldn’t be much of a problem as long as they bend in the same way). Most hackers will have the rest of the parts on hand, with the possible exception of the rangefinder. The code is up on the project site for a look-see or in case you want to build your own. The only problem that [Daniel] had when putting this all together was that the base was a little wobbly. He was able to fix that with some thumbtacks, and we think the next step for the project should be switching the light on and off over the internet. Producing items onto a screen simply by touching the air is a marvelous thing. One way to accomplish this involves four HC-SR04 ultrasonic sensor units that transmit data through an Arduino into a Linux computer. The end result is a virtual touchscreen that can made at home. The software of this device was developed by [Anatoly] who translated hand gestures into actionable commands. The sensors attached to the Arduino had a an approximate scanning range of 3m, and the ultrasonic units were modified to broadcast an analog signal at 40 kHz. There were a few limitations with the original hardware design as [Anatoly] stated in the post. For example, at first, only one unit was transmitting at a time, so there was no way the Arduino could identify two objects on the same sphere. However, [Anatoly] updated the blog with a 2nd post showing that sensing multiple items at once could be done. Occasionally, the range would be finicky when dealing small items like pens. But besides that, it seemed to work pretty well. Additional technical specifications can be found on [Anatoly]‘s blog and videos of the system working can be seen after the break. I managed to finish my first robot on witch I spent a lot of time, mostly because a lot of stuff was new to me. It is not very complicated but it seems to do it's job well. I posted everything about the build on my blog and also the parts I used (and the ones I rejected). It is a Tamiya tracked platform with dual gearbox. I used an Arduino UNO and a SeeedStudio motor shield to drive it from a 11.7 lipo battery I had from my RC heli. It uses a Ultrasonic sensor to look in front and also a DIY IR sensor for backing up. I also added a temperature sensor for the fun of it. This is my first Arduino project. I have worked with the handyboard and NXT few years ago. 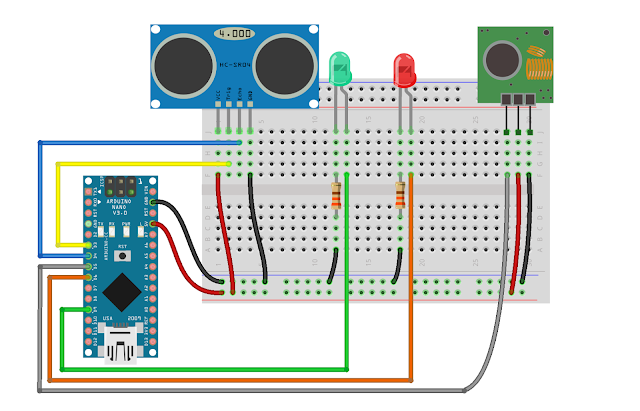 The Arduino seems popular and easy to get into for people from non-electronic background like me, so I decided to build something simple to get myself familiarize with the Arduino board and interfaces. For the look I decided to make it the Minecraft Creeper, for the non-gamers, it's a iconic mob that appears in the 8-bit inspired 3D game Minecraft. If you havent try it before, grab a copy now! The Physics Lab 2 post and Physics class progress described some experiments we were going to do this week with the ultrasonic range finder(s). What we actually did, after spending a fair amount of time discussing the schedule for the year and expectations (one of the students has not started yet, because of the amount of time he was putting into his Stanford essays—I hope he gets in after all the effort he has expended, was to drop balls and try measuring the drop with both the Maxbotix sensor and a video camera. We tried both a ping-pong ball and a slightly larger plastic ball. With both of them the Maxbotix sensor only detected them intermittently, and we go no useful data from the rangefinder. The HD video from the camera was more usable, but I was not aware that Tracker could use MTS (AVCHD format) files, since it greyed them out. I wasted a lot of time converting the movies to .mov format using iMovie, a piece of software that I have come to hate for its slowness, inefficient use of disk, rigid insistence on a specific directory structure, and generally unfriendly and unintuitive user interface. I’ve gone so far as to buy Premiere Elements, with the hope that it is not so awful (but I’ve not tried to use it yet, so it might be just as bad). It turned out that my son had not installed the Tracker software on the desktop machine, so we had to get out my laptop and try analyzing the frames there. I remembered how to calibrate and get the autotracking set up, but I forgot how to specify the beginning and ending frame (I eventually figured it out, but only after some false starts). The data was pretty clean, though autotracking did lose the ball at one point because of some really stupid projections about where it ought to be. Redoing the autotracking fixed that problem. The errors in the tracking due to motion blur were not noticeable in the position plot, made small wiggles in the velocity plot, and made huge wiggles in the acceleration plot. We did get a chance to talk about how a ±1mm error in position results in a ±3 cm/sec error in velocity and a ±90 cm/sec2 error in acceleration, when using 30 frames per second. I tried redoing the autotracking using the AVCHD format directly from the camera, but it turns out that AVCHD uses interlaced images, so one gets two pictures of the ball in each frame. When the ball is motionless, this makes a nice circle, but when the ball is moving fast, you get two striped circles that may overlap. Tracker has trouble handling the interlacing, though a really clever algorithm could take advantage of it to get effectively double the frame rate when tracking large objects moving with reasonably constant acceleration. Bottom line was that neither the ultrasonic rangefinder nor Tracker resulted in fast, painless measurement. We’ll have to try again next week, perhaps with bigger targets for the rangefinder. I initially thought that brighter light for the video would reduce motion blur by reducing shutter time, but it seems that the motion blur is due to interlacing, not to a slow shutter, so changing the lighting won’t help. Algorithmic changes to Tracker would be needed. Analyze the balldrop clips (in .mov format). For calibration, the distance we measured between the top and bottom stile of the file cabinet was 112cm. Since the ball was a few cm in front of the file cabinet, there may be some perspective error in using that measurement to calibrate the drop. Get Tracker to give you position, velocity, and acceleration plots. Use the fluctuation in the acceleration estimates to estimate the errors in the velocity and position measurements. Write a Vpython program that simulates the motion of the falling ball including the initial pause before dropping, but not including the bounces. Work problems 3.P.36, 3.P.40, 3.P.43, 3.P.46, 3.P.52, 3.P.65, 3.P.72. Do computational problem 3.P.76. Note that the computational problems for Chapter 3 are not independent of each other, and you should read all the preceding problems to get hints for this problem. The physics class that I’m doing with my son and another home schooler is going a bit slowly. The other student couldn’t make it again this week (Stanford early admission deadlines, and he needed the time to polish his application essays). My son and I compared answers to the Chapter 2 problems I’d assigned (see Physics Lab 2). We’d each made some careless errors (in one, I’d neglected to take a square root, though I’d written the right formula, in another, I’d forgotten to add the sideways movement during acceleration, in a third, my son had forgotten to divide by 2 at one point). In short, neither of us were doing “A” work—we knew what we were doing, but were being inexcusably sloppy in the computations (me more so than my son). I’ll have to do better on Chapter 3. I think that I won’t assign any exercises in Chapter 3 this week, to give the other student a chance to catch up. Instead, I’ll ask my son to finish the data-acquisition code for the ultrasonic rangefinder. I wrote some simple code running on the Arduino for gathering the data, and he was going to write a Python program (using PySerial) to record the data and output it in a format suitable for plotting with gnuplot. Our goal is to finish at least the Newtonian mechanics (Chapters 1–13 of Matter and Interactions) before the AP Physics C exam (afternoon of 14 May 2011), which gives us time for a little over 2 weeks per chapter. That seems like a fairly leisurely pace right now, but perhaps the chapters get harder. If we finish earlier, it might be worthwhile to do some timed practice with released tests, which are available at AP Central – The AP Physics C: Mechanics Exam. The Mechanics part of the exam is only 90 minutes (it is followed by the other half of Physics C, which we probably will not get to, unless we double our pace). I think that I’ll take the exam along with the two students, risking the embarrassment of them doing better than me. Finish the assignments from the previous posts (the text about how ultrasonic rangefinders work, the problems and program from Chapter 1, the problems and program from Chapter 2). //  serial line to a laptop. //   Input trigger: positive TTL pulse, 2 μs min, 5 μs typ. //   Echo pulse: positive TTL pulse, 115 μs minimum to 18.5 ms maximum. // As a kluge, the Ping))) is plugged into pins GND,13,12. // which only requires about 35mA. //      is higher in more humid air. // calls (200 microseconds does not seem to be enough). // Reads are very unreliable if the target is close than about 8cm. // Both are reported in milliseconds. // so that it approximates the time at which the pulse bounced off the object.